About the Book: Theodora loves everything to her way. She has everything planned out just the way she likes it. She has a perfect swimming routine, she has perfect exercises, a perfect routine for running her errands. When Chad moves in next door, Theodora notices that Chad is a bit odd. His house is a mess, his feathers are dyed strange colors, and he makes lots of noise with his art projects. Theodora is sure she and Chad will not be friends? But can the two ducks find a way to get along? And is either one really that odd? 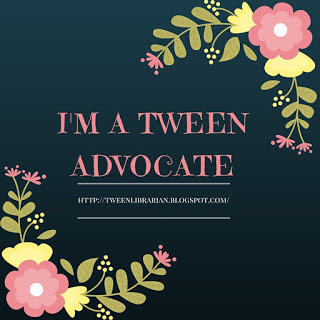 GreenBeanTeenQueen Says: Go get a copy of this book right now-I'll wait. Got it? Good-because you'll love it! 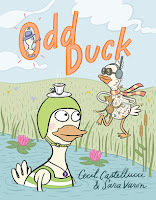 I read Odd Duck and then I had to read it over again because that's how much I fell in love with Theodora and Chad. This is a book that will make you laugh, cherish friendships, and even think about your own odd duckness in a way that is so completely and utterly adorable you won't be able to put it down. You'll have to recommend Odd Duck to everyone you know because it's just that great! Odd Duck is a short chapter book with a graphic novel feel. The book is illustrated in full color throughout and the chapters are short. It's a book that works well with all ages. I can't wait to share it with the kids at my library-graphic novel fans or not. I think it would be a great intro to graphic novels for readers who aren't sure they enjoy graphic novels as it has a nice picture book feel and there aren't any comic panels that the reader has to follow. I also think it would make a great read aloud for students. Theodora and Chad are just too funny and I'm sure you will see yourself in them. The story is very clever and very funny. The characters of Theodora and Chad are well developed and thought out and the writing shows us about their odd ways. The illustrations just add icing onto the cake and make a wonderful addition to the book. Not only do we get to read about Theodora and Chad but the illustrations expand upon their characters and tell us even more about their odd duck habits. Sara Varon adds in additional jokes and even some cameos from previous books that are so fun to look for. A perfect pairing of text and illustrations, Odd Duck will make readers embrace and stand up and cheer for their own odd duck selves!